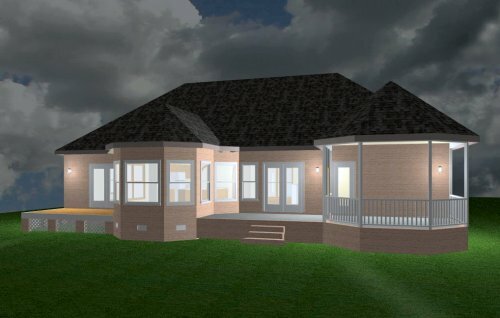 Single Story Home Under 2500 Sq.Ft.-RS031101-Carolina Coastal Designs, Inc. 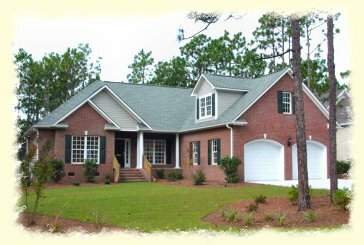 This transitional 3-bedroom home stands proudly alongside the Members Club Golf Course in St. James Plantation. This home was uniquely designed to take advantage of the natural vistas afforded by the lush green fairway at the rear of the property. A cozy southern-style covered porch graces the front entrance of this home. The entry foyer and the formal dining room make use of a dropped-soffit to delineate their area from the spacious living room that is the central core of this house. The living room has a cozy gas fireplace and built-in bookcases. The modern kitchen has a snack bar adjoining a brightly lit, octagonal shaped, breakfast area. French doors open from the living room to an outdoor deck and a screened in porch, both offering beautiful views of the golf course. A private master bedroom suite includes a walk-in closet and a private bath with a spa bathtub. Two additional bedrooms and a second full bathroom complete the sleeping quarters. The laundry room is conveniently situated off the rear hallway, near the entrance to the two-car garage. A staircase off the rear hallway leads to the 2nd floor. 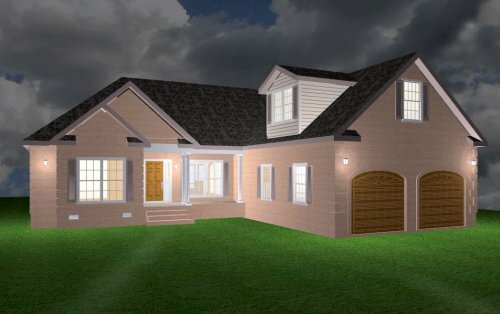 This level contains a dormered bonus room and abundant attic storage.